Our last morning in Beaune, we had to take time out for an essential: laundry. One of the wonderful things about travel is that is makes even mundane tasks into an adventure. Laundry is a perfect example. You have to be able to locate a good laundromat, make change in a foreign currency, decode cryptic directions and get what is most likely outdated equipment to work, all without ruining everything you have to wear. I suppose you could just drop it off at a full-service place, but where’s the fun in that? While our clothes were spinning, I set off to check out the Beaune market. Calling a French marché a “farmers’ market” doesn’t really do it justice. Most American farmers’ markets are destination shopping; you go because it’s more fun than Safeway. Yes, you can find fresh, decently-priced produce, but mostly what you find are expensive organic offerings, overpriced hummus, and maybe a couple of local cheeses. A French market is an institution. Although more and more French people are starting to stock up at supermarkets American-style, it is still traditional to frequent the local market for the majority of one’s produce. 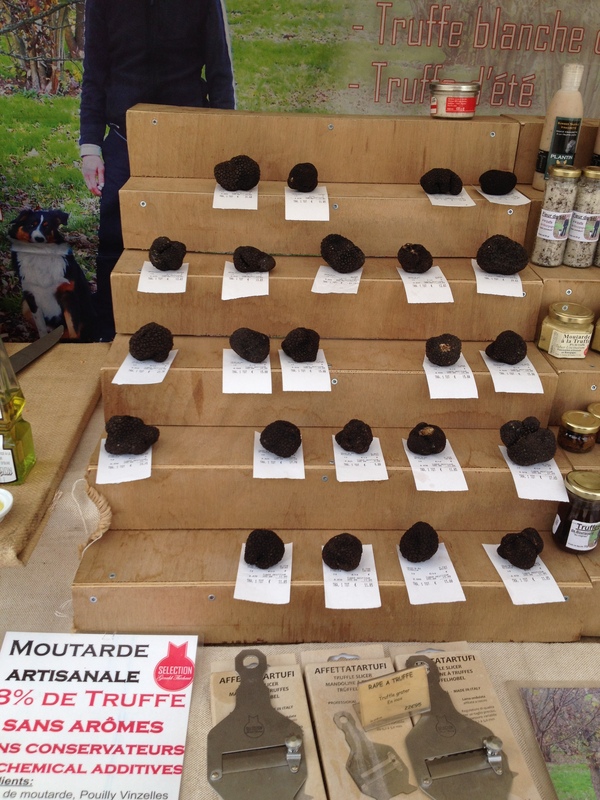 Whole black truffles at the Beaune marché. A French marché is a full-on sensory experience. Every imaginable item is available: the most beautiful fresh seasonal produce in every shape, color, and variety; artisanal meats and cheeses; rows upon rows of little pots of spices you’ve never seen before; hundreds of different kinds of olives; animal parts you didn’t know could look so delicious. But there is also clothing, hats, bags, households items, gifts…it can be overwhelming. You have to jostle with the crowd and speak to the vendors, since they don’t like you to fondle their produce. Ask for a couple peaches, and the vendor (most likely an adorably toothless older gentleman) will ask you when it’s for. Say you want it for today, and he will carefully select a peach that is so perfectly tree-ripened that it practically oozes its sunny aroma right through its little paper bag. It bursts with flavor and juice and is the most delicious thing you’ve ever tasted. I need to go back to France now. Once we dragged ourselves away from the stall with the melt-in-your-mouth Spanish ham, we loaded up our sparkling-clean laundry and hit the road for Alsace. We decided we might as well stop in Dijon for lunch, since it was (kind of) on the way. We settled into the terrace of a bustling bistro and decided to give some traditional Dijonaise cuisine a try. Let’s just say this: Dijonaise food is not light. This was the first meal to actually leave me in physical pain, and we hadn’t exactly been slacking in the food department. I blame our starter (which we shared, for the record! ): a soup of escargots and croutons in a broth which was essentially a half-gallon of whole cream. And that was just the beginning. We limped back to the car and decided it was for the best that we weren’t spending more time in Dijon. Our “gîte” in Strasbourg was in fact a beautiful one-bedroom apartment recently renovated by its sweet owners who lived around the corner. The apartment was like an Ikea model home: everything new and sparkling clean and color-coordinated. I never wanted to leave. But there was a whole city to explore! We hopped on the tram and headed into town, not really knowing what to expect. 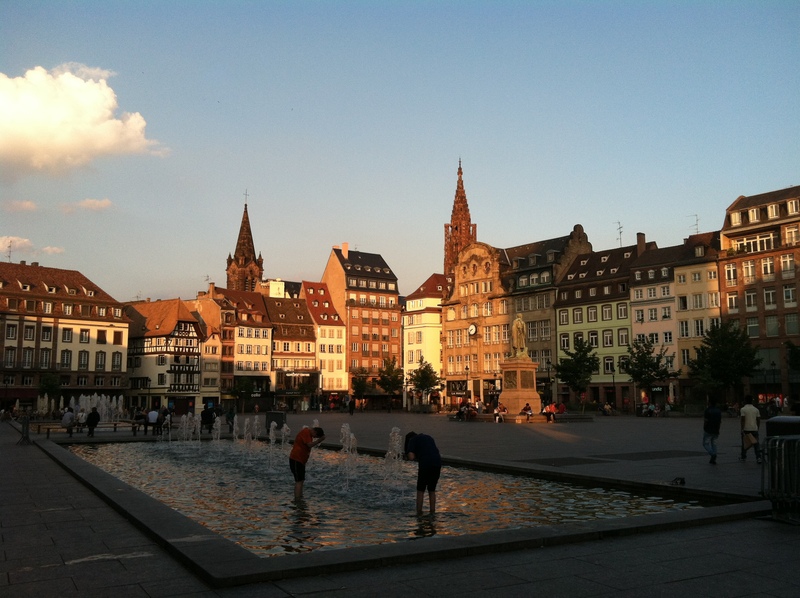 We landed in central Strasbourg right at the “golden hour,” that moment when the sun is just hitting everything at the perfect angle and everything is glowing. We wandered through narrow streets lined with half-timbered houses until we hit the canal that frames the city, and then we turned and wandered the other way. 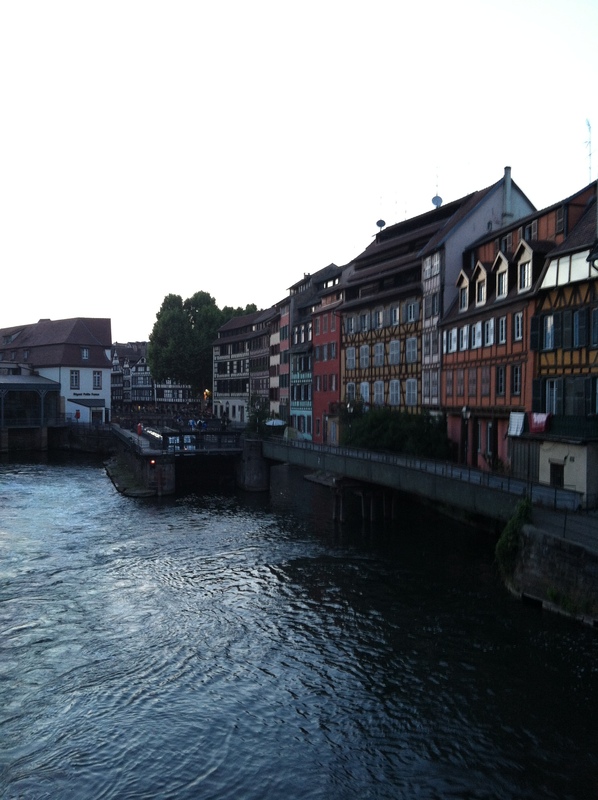 Strasbourg, and Alsace in general, has a complicated history which involves being squabbled over by France and Germany for as long as anyone can remember. The result is a unique culture which is a blend of French and German influences. The architecture, food, and even the regional dialect are all distinctly different from the rest of France. Alongside the rich history and traditions of Alsace, Strasbourg is also a thoroughly modern city, with lots of Art Deco architecture as well as contemporary structures that somehow manage to flow neatly with the city’s medieval heart. Notre-Dame de Strasbourg (all the cathedrals are named Notre-Dame, in case you were wondering). We walked around a corner and the cathedral popped out at us, seemingly out of nowhere. 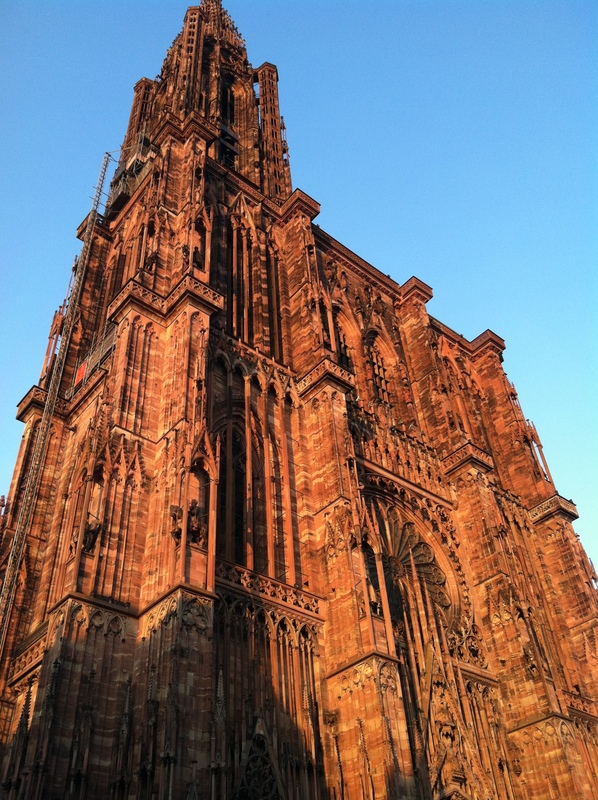 I will always have a soft spot for Notre-Dame de Paris, my first cathedral; but honestly, Strasbourg’s is truly amazing. Built out of pink stone from the Vosges mountain range, it looks like a stalagmite fell in love with spun sugar. The intricate details, as delicate as lacework, are especially impressive when you remember that its construction began in 1015 and was completed in 1439. Over four hundred years went into the creation of this masterpiece, a baroque organ concerto in stone. Half-timbered homes in Petite-France along the canal. 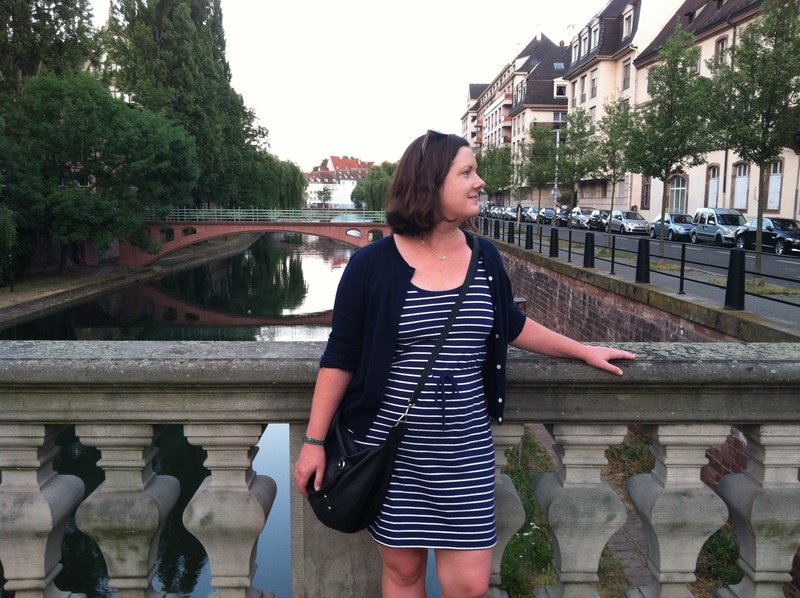 We could have wandered the streets of Strasbourg all night, but eventually we were ready to sit and attempt a “light” dinner, for reals this time. We found a winstub, a traditional Alsatian wine-centric restaurant, and decided to “just” order an onion tart and a salad. 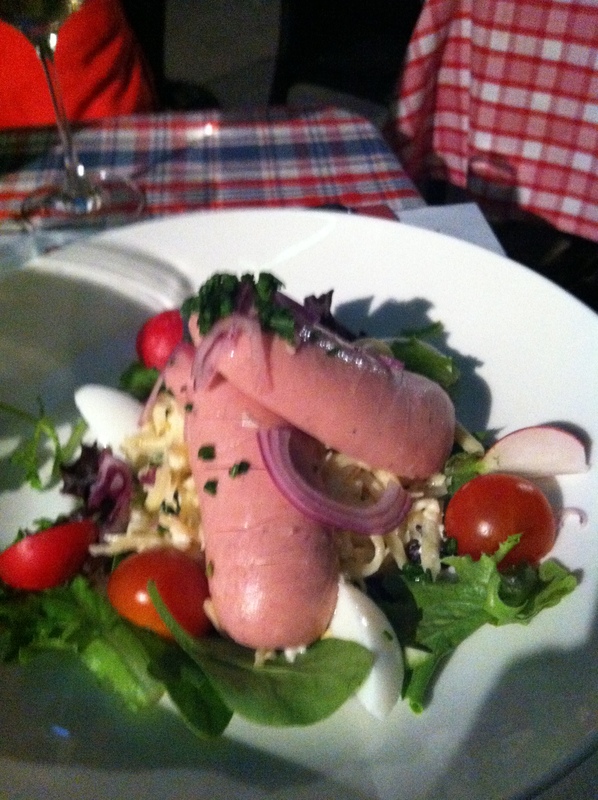 To be fair, we had been warned about la Salade Alsacienne. La Salade Alsacienne, in all its glory. We had, in fact, been told emphatically *not* to order what is essentially a huge ball of grated Gruyère and sausages on a minimal bed of greens. But we figured, pourquoi pas? It was surprisingly delicious, and somehow not as heavy as it looks. 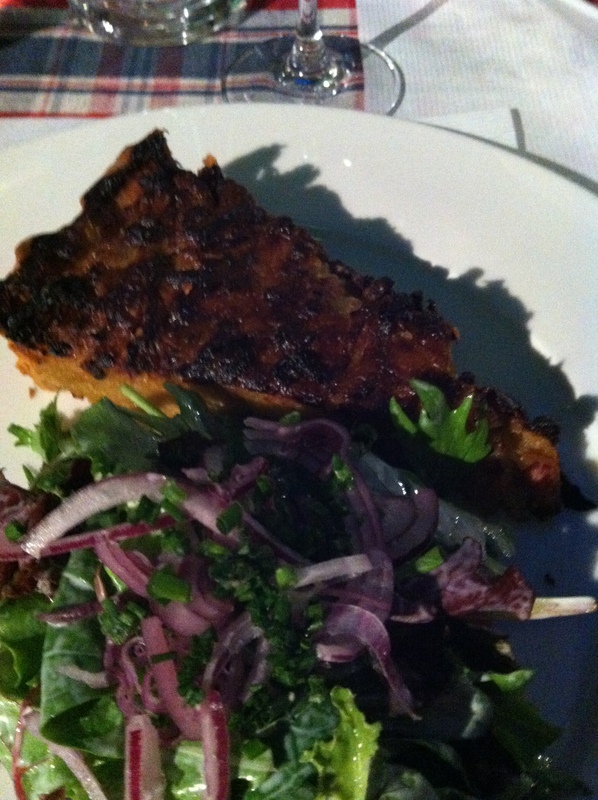 The tarte à l’oignon was heavenly and also on the lighter side, caramelized onions and a flaky crust accompanied with some spicy greens. Tarte à l’oignon (onion tart). 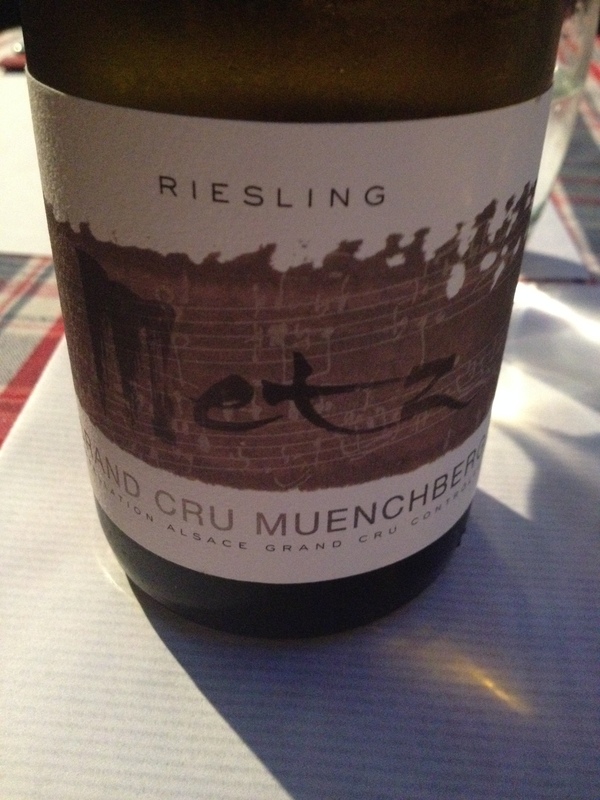 And of course, it all played perfectly with a bottle of Alsatian Riesling. Alsatian wines don’t have to be sweet. We closed out the winstub and rounded the evening off at L’Academie de la Bière, before hopping back on the tram for “home.” Strasbourg had already exceeded our expectations, and we had only just arrived! If we look a little puffy, well, that’s because we were. I blame Dijon. 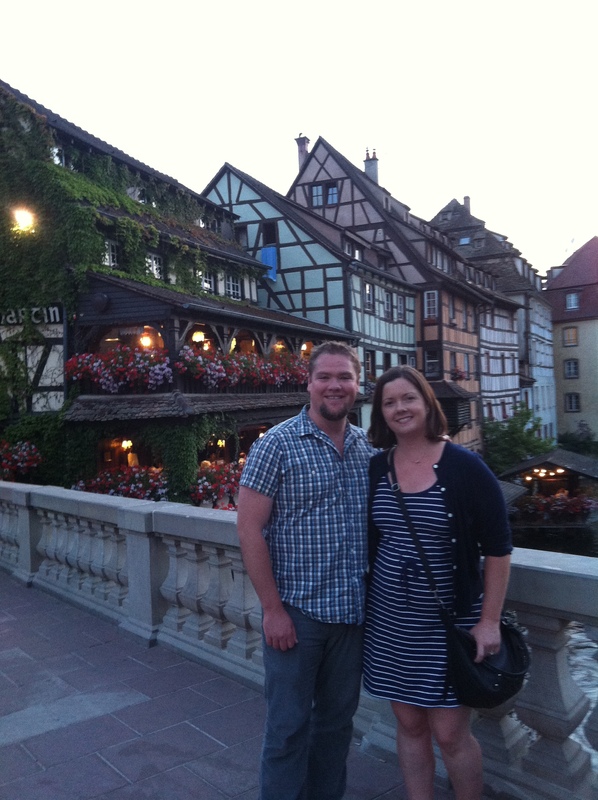 Stay tuned for the continuation of our explorations in Alsace! This entry was posted in Food, Travel and tagged Alsace, Alsacienne, Alsatian, cathedrals, Dijon, escargots, farmers' market, food, France, Riesling, Strasbourg, wine on July 25, 2014 by esimmeth. 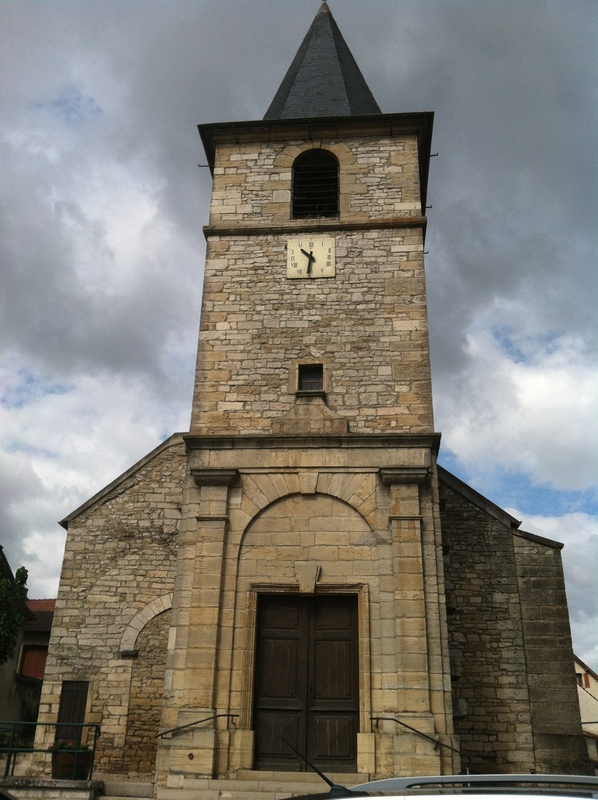 After a hearty breakfast of ham, cheese, and croissants at the gîte, we set off for Vosne-Romnée, a tiny commune about 30 minutes north of Beaune that is home to some of the most famous vineyards in Burgundy, if not in the world. Our first stop was at Domaine Gérard Mugneret, which just so happens to be the next-door-neighbor to a little establishment known as Domaine de la Romanée-Conti. More on that later. Pascal Mugneret led us down a short flight of stairs to the simple underground cave and began to expound on the importance of terroir in his winemaking. His goal as a winemaker, he said, is to stay out of the way of the terroir, and to let it speak for itself. He explained in detail the differences between the various soil and rock strata in the area and their role in creating the complex yet elegant Pinot Noirs that make the region’s wines world-famous. Wine-tasting in Châteauneuf-du-Pape had been a fairly laid-back affair, even at the world-class Château de Vaudieu; in Burgundy, I was learning, wine-tasting is treated reverently, almost like a sacred ritual. The winemaker spoke in hushed yet passionate tones about the depth of soil, clay, sand, and limestone in each parcel we tasted from. We were largely tasting barrel samples of the still-aging 2013 vintage, each with its own distinct personality, bright red fruit playing against gripping tannins. 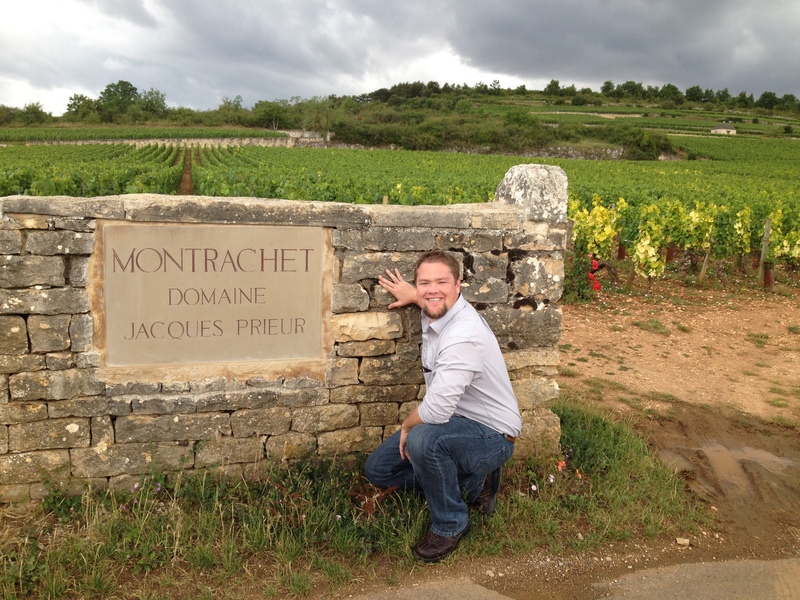 Drew posing for the obligatory tourist shot in front of the Montrachet vineyard. After a morning spent on Pinot, we headed south to Chassagne-Montrachet for some Chardonnay at Domaine Bernard Moreau et Fils. One of the “fils” (sons), Alex, led us through an incredible side-by-side comparison of a dozen wines from Premier Cru vineyards, each with a unique nuance of minerality and acidity. Once again, the importance of terroir was stressed, and its effect was clearly noticeable with each wine showing its own distinct flavor profile character thanks purely to the expression of the soil, rocks, clay or sand it grew out of. Each wine rang its own pure note, clear as a bell: Meyer lemon, pink grapefruit, crisp pear or creamy vanilla, often with differences of just a few feet between rows or parcels to create a profoundly different experience. We were on a tight schedule that day, so we went for a “quick” lunch (only two courses, sigh) at Auprès du Clocher in Pommard on the recommendation of Alex Moreau. The grey, chilly morning had given way to a stormy afternoon, but the rain just made our coq au vin that much more satisfying. The wine-soaked chicken fell off the bone into a rich broth of bacon, mushrooms, and vin rouge that paired naturally with an excellent bottle of Bourgogne. The chef greeted us warmly as we were leaving, wishing we could have stayed longer. Our next appointment was at Domaine Comte Armand just across the way, where we met the newly-fledged winemaker, Paul Zinetti. Paul had just taken over from Benjamin Le Roux, who had recently departed to focus on his own projects. The new winemaker was clearly crestfallen over the recent hailstorm which hit that region of Burgundy especially hard, ruining as much as eighty percent of the crop in some areas. Paul was stoic in the face of (potential) adversity, however, and cheered up especially when discussing his Aligoté wines, a traditional yet lessern-known white varietal grown from old vines in tiny quantities. The Pinots we tasted, barrel samples from 2013, showed intense tannic structure and elegant minerality that will surely make a great name for the next generation of winemaking at Comte Armand. 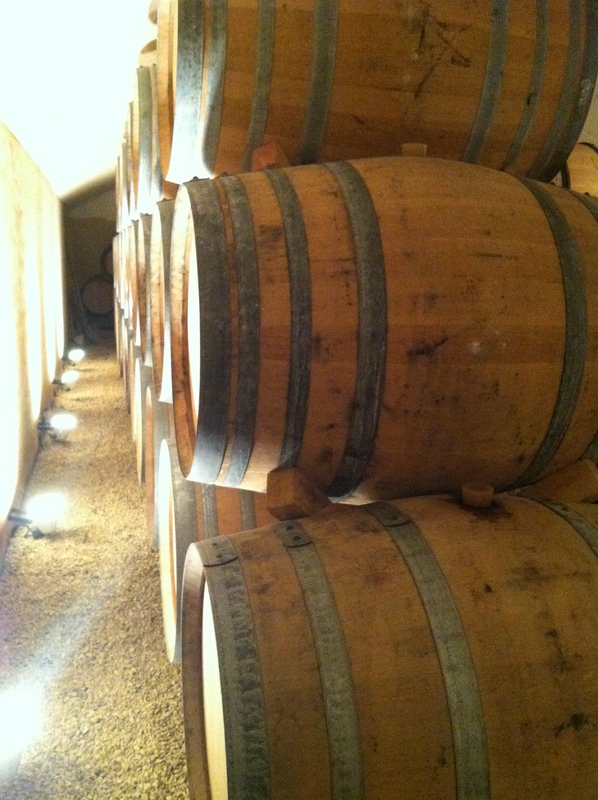 The barrel room at Benjamin Le Roux. Our last stop was, ironically, at Benjamin Le Roux’s own eponymous winery in Beaune. Benjamin discussed the vagaries of the wine industry, not just in the fluctuations, of nature, but also in human variables such as changing global demand and palates. He also expressed the importance of balance in a winemaker’s personal life, saying that while his wines might be like his children, his actual (human) children will always come first. Zen lessons to round out a day that was the equivalent of a master class in Burgundy. 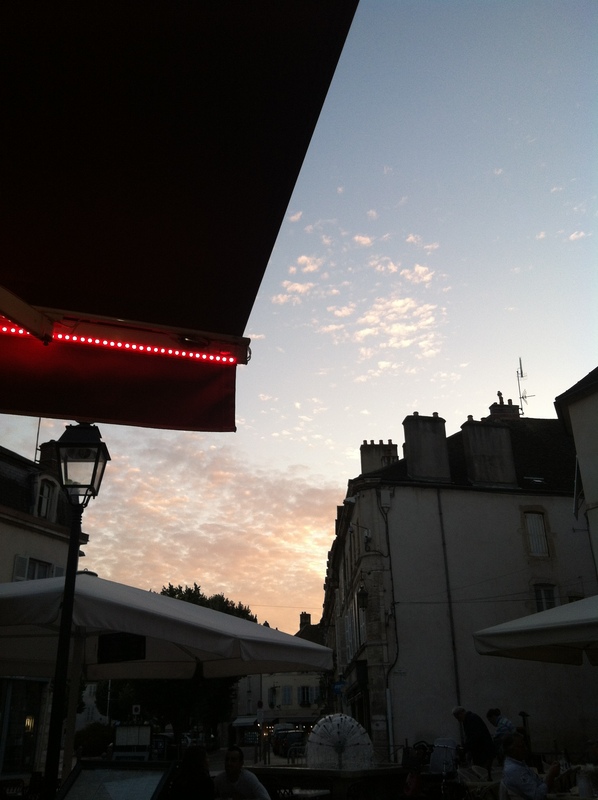 After a day full of wine, Drew just wanted a beer; we lounged on a café terrace while France won a match in the Coupe du Monde, moving into the semi-finals. All of Beaune erupted into a makeshift parade, fans of all ages with painted-blue faces, French flags, and streamers marching in the streets and honking car horns in celebration. Still half-full from lunch, we ended the day with another “light” dinner of escargots and steak tartare, both Burgundian specialties. Escargots are not something I would want to eat every day, but raised on fine herbs and drenched in butter, they are not unlike mussels but earthier, as is to be expected. Finally, we headed back to the gîte to drink a bottle of Gigondas and watch a terrible movie dubbed in French. The usually sleepy placed had become a veritable war zone, with much screeching over the owners’ cat who had apparently gotten into a scuffle with a new tenant’s Weimaraner. Once the wailing subsided, we enjoyed a quiet evening, with an awful movie made palatable by an awfully good bottle of wine. This entry was posted in Food, Travel and tagged Aligoté, Beaune, Bourgogne, Burgundy, Chardonnay, escargots, France, gîtes, Pinot Noir, wine on July 24, 2014 by esimmeth.